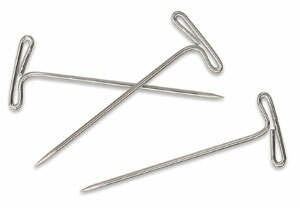 Use T-pins in a range of art, sewing, and crafting projects. Use them to pin fabrics together for sewing and to hold patches in place. They're great for anchoring work to a board while doing macramé, and also work well for presenting art. These T-pins measure 1-1/2" (38 mm) long and come in boxes of 35. ® Wrights is a registered trademark of Simplicity Creative Group.